Traditional cottages line the Cornish town of Boscastle. 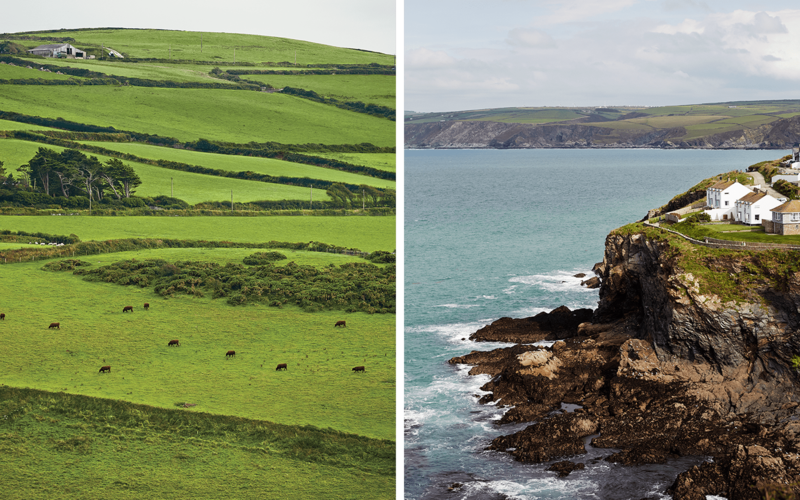 Cornwall has always been a place apart from the rest of England—a proud and fertile province where the pasture meets the sea. But now the old traditions are giving way to something new, as the next generation of chefs, farmers, and fishermen transform their pastoral corner into a culinary eden. 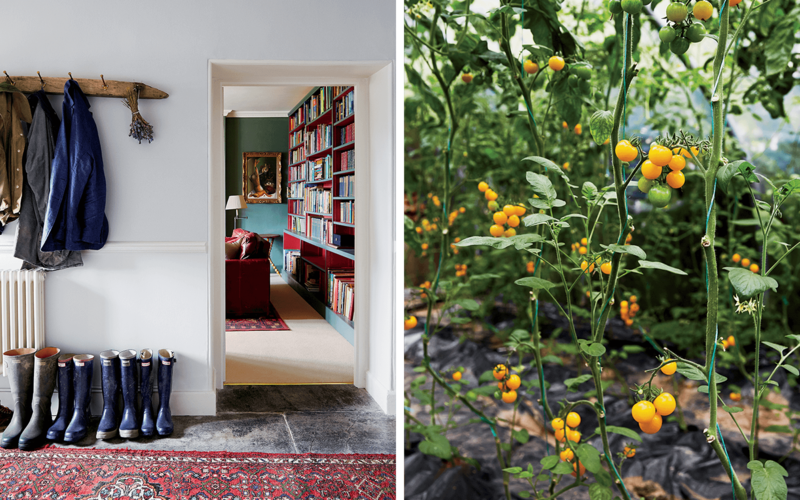 One day last summer the chefs Tom Adams and April Bloomfield splashed through a stream and then crossed a field behind Coombeshead Farm, their 18th-century Cornish farmhouse. Adams, of London’s celebrated Pitt Cue, and Bloomfield, a British native best known for her New York City restaurants the Spotted Pig and the Breslin, have turned the property, which is set on 66 acres of gently rolling hills near the village of Lewannick, into a five-room inn and restaurant. They were expecting a dozen dinner guests that evening, and the afternoon’s mission was to forage ingredients—wild sorrel, blackberries—for the meal. The land doubles as a buffet, if you know what to look for. I didn’t, so Adams narrated. We passed wild watercress, common hogweed (whose seeds taste of citrus—more orangey than lemony), and pineapple weed, which Adams plucked, rubbed between his fingers, and held to my nose. It offered an instant olfactory trip to the tropics. The sorrel we gathered would go with pig’s-head rillettes. Blackberries were destined for an arranged marriage with Cornish cream. “Such abundance,” Bloomfield said. 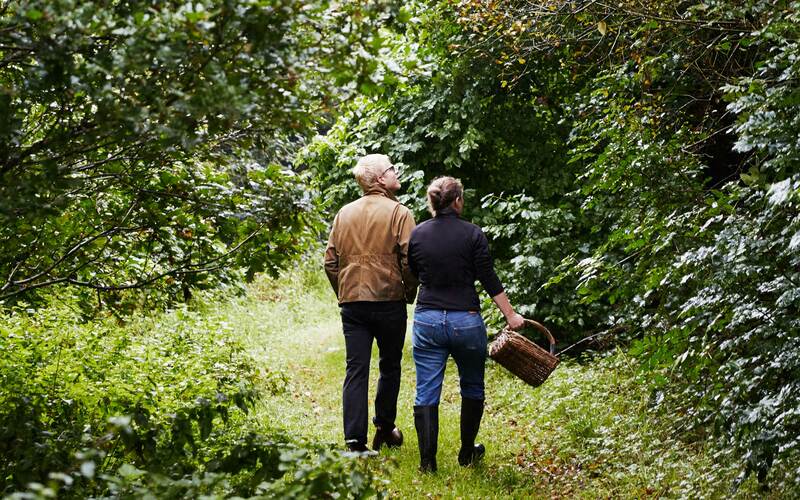 Tom Adams and April Bloomfield forage for ingredients at Coombeshead Farm. The object of their awe was in a tree: a chicken-of-the-woods mushroom about the size of a human head. Within hours, it would be transformed into the best version of itself, bearing the wood-red oven’s char, the fragrance of thyme and garlic, and the glow of golden Cornish butter. It was an expression of Cornwall itself—unexpected, unfussy, and gorgeous. Bloomfield and Adams aren’t the only outsiders to realize the fertile promise of Cornwall. Some of Britain’s most inventive young chefs and entrepreneurs are settling here and finding inspiration in the region’s traditions. Together with the Cornish farmers and fishermen who trace their roots back generations, they are sparking a profound, renewed confidence in the bounty of this land. What’s old is new again—and it tastes phenomenal. Before meeting Bloomfield and Adams, my husband, Tristan, and I spent three days hiking 30 miles of Cornwall’s South West Coast Path, from Boscastle to Padstow. The poet John Betjeman, who spent much of his life in Cornwall, described Boscastle as being set in “half a mile of winding, gloomy chasm where overwhelming cliffs of shale and slate are parted by tidal water a stone’s throw across.” In the sunshine, the fishing village sparkled. When it rains, the terrain can be tragic; in 2004, a flash flood washed away much of the village. From Boscastle, the path traverses slope after seaside slope, some so steep that we ascended and descended by earthen staircase. Gulls squawked but kept their distance, much as the locals did. Everywhere we went, they were welcoming but reserved, embodying the ambivalence that the Cornish have about outsiders. Legend has it that when Saint Piran, now Cornwall’s patron saint, arrived, having floated on a millstone across the Irish Sea, his first converts weren’t people—they were a badger, a fox, and a boar. Left: Cattle grazing near the village of Boscastle. Right: The village of Port Isaac, in Cornwall, England. It’s easy to see why outsiders still come to this fat finger of land, which points from Britain’s southwestern-most corner across the Atlantic. Though Cornwall is England’s poorest county, it may be its richest in heritage and beauty. Every hill on our hike brought new vistas, every bend a different field—this one framed by an ancient stone wall, that one filled with golden rapeseed blossoms. Just as abundant: the stories, stretching back centuries. In Trethevy, we sat for a few silent minutes in a 14th-century chapel dedicated to Saint Piran that had languished as a farm outbuilding until its restoration in the 1940s. In Tintagel, we clambered amid the cliff-top remnants of what’s said to be King Arthur’s castle—a history buff’s dream, a health-and-safety officer’s horror. In several places, we marveled at gravity-defying seaside towers of slate, souvenirs of Cornwall’s quarrying days. Though tourists throng Port Isaac, the setting for the TV show Doc Martin, and Padstow, a foodie destination, we encountered other hikers only occasionally. As we descended into one narrow valley, an elderly couple negotiated the opposite slope. Upon drawing closer, I noticed a pattern: the man would bound down 10 or 12 steps. Then, he’d turn and wait expectantly for the woman. She had two walking sticks, one in each hand, and took care with each step, never rushing. When she approached him, she held both sticks in one hand. He reached out to her, she grasped his hand, and they walked together for a few steps before he sped his way down again. We ended our hike in Padstow, which owes its culinary stardom to celebrity chef Rick Stein, who moved to Cornwall in the 1970s. One evening, we dined at his casual restaurant Stein’s Fish & Chips. The lemon sole in a perfectly crisp batter was heavenly—the fact that we had to pay one pound for tartar sauce, less so. 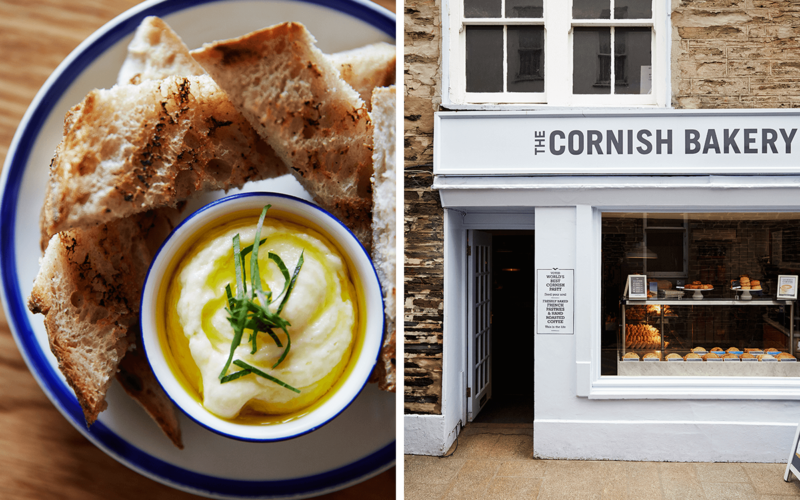 Left: Smoked-haddock brandade and sourdough toast at Outlaw’s Fish Kitchen, in Port Isaac. Right: A branch of the popular Cornish Bakery, in Padstow. The more recent cohort of non-native entrepreneurs includes Tarquin Leadbetter, proprietor of the five-year-old Southwestern Distillery. Reared in neighboring Devon, he spent several years in London before settling here. “I wanted to quit my desk job, go surfing in the morning, and make gin in the afternoon,” he said. There’s a charm in something unrefined. We want to create a place that not only fills the stomach but also lowers blood pressure and makes guests feel at home. We want Coombeshead to be wholesome. Farming, Hellyar told me, “is hand-to-mouth living” for most Cornish families. The dairy farms that once dotted the region are mostly gone, including his family’s. The costs were too high, revenues too low. Today, part of the Hellyar land—set amid coastal countryside designated by the government as an Area of Outstanding Natural Beauty—is a caravan park. Over eight weeks each summer, the Hellyars reap four times as much revenue from trailer fees as they do annually from barley and lamb. And local. The Coombeshead team produces its own vinegars, kombucha (flavored with foraged pineapple weed and honey from the farm), and a fantastic fermented-tomato jam, made with tomatoes from Marky Souter’s farm down the road. There’s no citrus, not even for the gin and tonics, because it doesn’t grow in England; the delicious alternative is a house-made black-currant-and-nettle cordial, with nettle leaves for garnish. There’s no olive oil, either. One concession: coffee, which obviously doesn’t grow here (the beans come from Origin, a local roastery). Left: The entrance and library at Coombeshead Farm. Right: Tomatoes growing on the vine at Marky Souter’s farm, which supplies the inn’s kitchen. When Adams and Bloomfield bought the farm, rumors flew around the nearby village about the buyers’ identities. A local gossip reported that Adele was moving in; another rumor named Jamie Oliver. The curiosity was understandable. Even Adams and Bloomfield themselves still don’t know what Coombeshead might become, though they imagine more than the existing inn. Bloomfield grew up in inner-city Birmingham and fell in love with food and agriculture during countryside sojourns in her teens. “We’d buy a bag of peas from a farm stand and just eat them raw,” she said. Her dream is to welcome guests beyond the expected demographic of well-to-do Londoners and foreign foodies. She’s already drafting mental plans for turning outbuildings into educational facilities for working-class youths, like she once was. It’s not surprising that Bloomfield wants others to experience the Cornish countryside. One morning, I rose with the sun, put on wellies, and walked to a nearby field where a stand of trees stood majestically silhouetted against the morphing skies—the lingering nighttime blues giving way to pinks and oranges. The grass was wet with dew, the dawn full of possibility. As I neared the house, the hens clucked their greetings. There are no flights to Newquay, Cornwall’s main airport, from the United States, but connections can be made through Dublin or London Gatwick. Train service from London’s Paddington Station takes four to five hours. Encounter Walking Holidays: This Cornish company designs custom itineraries through the bucolic southern English countryside and will handle all your trip logistics, from bookings to luggage transfers between B&Bs while you hike. encounterwalkingholidays.com. The Avalon: This gracious B&B’s best rooms feature sweeping views across the garden and down to the sea. For breakfast, there’s homemade yogurt, local bacon, and kippers. Tintagel; theavalonhotel.co.uk; doubles from $110. Coombeshead Farm: Chefs April Bloomfield and Tom Adamshave transformed this 18th-century farm into a charming bed-and-breakfast. The hyper-local menus, served at a communal dining-room table, include house-made pickles, kombucha, and vinegars, as well as vegetables and fruit grown on premises. Lewannick; coombesheadfarm.co.uk; doubles from $217; prix fixe $62 per person. Boscastle Bakery: Try the traditional Cornish pasties at this village bakeshop: steak, pork and apple, or cheese and onion. fb.com/boscastlebakery. Golden Lion Inn: This harborside pub has been pouring classic English bitter pints since the 1700s. On a sunny day, sit on the balcony and gaze at the water; if it’s cold, there’s no better spot than right next to the fireplace. Port Isaac thegoldenlionportisaac.co.uk; entrées $7–$18. The Mariners: An airy, beachy pub where the menu is overseen by chef Nathan Outlaw and a handful of the almost 40 beers come from the local Sharp’s Brewery. Rock; themarinersrock.com; entrées $16–$30. Outlaw’s Fish Kitchen: A casual, Michelin-starred restaurant offering Nathan Outlaw’s seasonal small plates, like cured salmon with pickled mushrooms and baked hake with portobellos and rosemary butter. Port Isaac; outlaws.co.uk; small plates $8–$16. Paul Ainsworth at Number 6: Modern Cornish cooking served in an 18th-century town house. Start with fried Porthilly oysters, pork, fennel, and apple, and end with Ainsworth’s trifle made with blood orange, rhubarb, and saffron. Padstow; paul-ainsworth.co.uk; entrées $37–$50. Stein’s Fish & Chips: A local staple where the chips are cooked in beef drippings and the fish—like delicate lemon sole—is fried in shatteringly crisp batter. Padstow; rickstein.com; entrées $9–$14. Stein’s Patisserie: Stop in celebrity chef Rick Stein’s bakeshop for a variety of treats. Order the haddock-and-clotted-cream pasty, a rich, intriguing twist on a regional classic. Padstow; rickstein.com. South West Coast Path: A breathtaking 630-mile hiking route that includes the entire Cornwall coast as well as parts of neighboring Devon, Somerset, and Dorset. southwestcoastpath.org.uk. St. Enodoc’s Church: Poet and author John Betjeman is buried in the graveyard of this stone church, parts of which date back to the 12th century. Trebetherick; 44-1208-862-398. St. Piran’s Chapel: This small, slate-roofed house of worship is dedicated to one of Cornwall’s three patron saints, who was thought to have miraculously floated from Ireland to Perran Beach in the fifth century. Trevethey; achurchnearyou.com/trethevy-st-piran. Tintagel Castle: Occupying a headland that has had homes and fortifications since Roman times, Tintagel gained fame in the 12th century after the medieval historian Geoffrey of Monmouth linked it to the legend of King Arthur. Most of what remains today was built by Richard, Earl of Cornwall, in the 13th century. Tintagel; english-heritage.org.uk.